Ken Hill had some of his best seasons in Montreal. Maybe his son can do the same. Yes, Hill is the son of Ken Hill, who pitched in MLB from 1998 to 2001, including in Montreal from 1992 through 1994. And one of his most memorable seasons was the Expos’ most famous season, 1994, where he earned his only All-Star nod and tied for the National League wins lead with 16. That season was cut short by the MLB players’ strike and ended after 144 games, with the Expos leading all of baseball with a 74-40 record. And it’s the subject of a whole lot of “what could have been” pieces; the team sure looked to have an excellent chance at playoff success that year, but the playoffs never happened, and Hill, John Wetteland and Marquis Grissom were all traded in the offseason for next to nothing thanks to budget concerns, while Larry Walker was allowed to leave as a free agent. The Expos immediately fell off a cliff, finishing last in the NL East in 1995 and struggling until their eventual 2005 relocation to Washington. But there are still a lot of fond memories of that team in Montreal, and of the 1994 team in particular, to say nothing of the efforts to try and get MLB to return to the city. And while the younger Hill may not ever get a chance to play in Montreal (there are a whole lot of CFL practice roster quarterbacks who don’t), it’s certainly at least interesting to see him join the Alouettes, and to head to a city where his father was so famed. There’s a lot more to the Kenny Hill story than that, of course, as NCAA fans are well aware. For one, he started his career at Texas A&M in 2013, not long after current Alouettes’ head coach Mike Sherman was fired in December 2011. (Hill committed in April 2012, so it’s not like he was ever expecting to play for Sherman, but Sherman certainly has some familiarity with Hill from watching and recruiting him in high school.) He also began as the backup to another current CFL quarterback, much-heralded Hamilton Tiger-Cats’ backup Johnny Manziel. But Hill went on to plenty of success in his own right, doing okay as a Manziel backup in 2013 and then breaking Manziel’s passing record with 511 yards (and four touchdowns) in his very first start against then-#9 South Carolina in 2014. The rest of Hill’s Texas A&M career was rougher, as his production took a nosedive and he was eventually replaced by Kyle Allen and suspended for a violation of team rules. But he transferred to TCU in 2015, and shone for the Horned Frogs in 2016 and 2017. 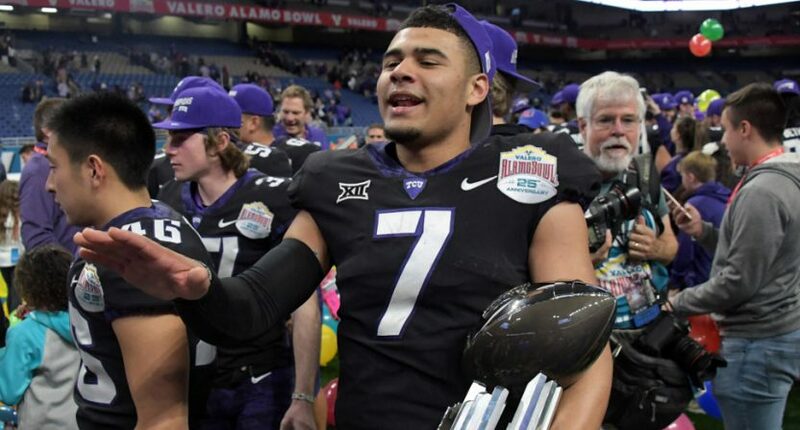 This last season was particularly good for him, as he threw for 3,152 yards with 23 touchdowns against eight interceptions and a 67.3 percent completion mark in 2017 while leading TCU to an 11-3 mark. And that completion percentage in particular is a nice sign, as it’s so crucial to success in three-down football. Will Hill ever get a chance in the CFL? A lot will depend on what he can show in practice, and a practice roster slot doesn’t necessarily mean anything. But it’s notable that there’s perhaps more opportunity for young quarterbacks in Montreal than there is anywhere else in the CFL right now, especially with the Alouettes starting the season with two bad losses where they scored only 10 points each. And veteran starter Drew Willy was particularly unimpressive in that second one, completing just 64 percent of his passes for 111 yards and a touchdown, while backup Jeff Mathews went three for five for 18 yards with an interception. The Als’ other QBs are Matthew Shiltz (injured, with only one year of CFL experience) and Garrett Fugate (with even less CFL experience than Shiltz), so there’s lots of potential opportunity there. We’ll see if Hill gets a chance, and we’ll see what he can do. But Ken Hill’s son returning to Montreal to play for the local CFL team is certainly an interesting story, even if that’s not too relevant to his on-field prospects.